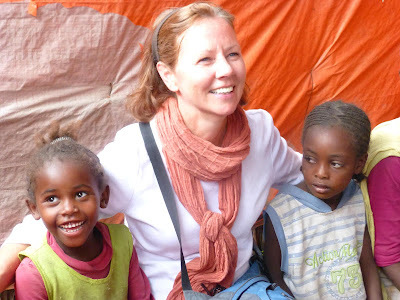 Lifesong Ethiopia is all about changing lives and giving hope to some very destitute people on earth. We, which includes anyone that has ever donated, are helping to change the futures for the 830 students that are enrolled in our schools in Ziway and Adami Tulu, Ethiopia. Gamado is one of those little boys. He is 7 yrs. old and in the first grade, learning Amharic and English. Every morning, at the flagpole ceremony, he is hearing God’s Word, praying and singing songs. He has a smile on his face and a twinkle in his eyes. We got the opportunity to walk Gamado home, after school, one day and meet his family. His mud block house with the dirt floor is just a short walk away, in the poor village of Adami Tulu. It was dark in his home. The single light bulb in the ceiling either was broke or is simply a luxury that cannot be afforded during the day. His frail mother stood leaning against the mud wall during the visit so her few stools, the only furniture in the bare house, could be used by her visitors. Fatma, the mother, introduced her other children. Kedir is the oldest son, 10 years old, plus a small son of five years and the two year old baby girl. She mentioned another child, the twin of the 5 yr. old, but he died already. Fatma appeared to me a tired, worn women and no wonder, she was a daily laborer. Each morning she needed to arise and go out searching for work to earn money that day. Sometimes she inspected maize, other days it was washing clothes by hand. If there was no work that day, there would be no money to buy food either. When asked if Kedir was in school, Fatma reported that he got registered in the government school, but she did not have money to buy his school books. Besides, if he cared for the landlord’s animals, they could receive free rent. It seems that the opportunity for an education for Gamado’s older brother has passed him by. We had taken a live chicken and a warm blanket as gifts to our student’s family. In a land where meat is only for special holidays, we knew the chicken would be really enjoyed, unless it needed to be sold for more important items. Fatma held tight to the blanket. I understood when she looked in despair toward the meager pile of thin blankets lying on the cold, earth floor. Oh my, I camp in a tent in better luxury than her family lives every single night. There is no running water available in her home. Water must be collected and carried every single day. A normal stove and refrigerator are also absent in her type of life. Her tiny cooking stove, only big enough for one pot, requires coal which needs to be purchased. No money, no cooking. Fatma is a representative of the lives that Lifesong Ethiopia is trying to change. She was born in poverty and poverty made the choices in her life. She was a “Child Bride”, given away at a young age, so her own family would no longer have the burden of feeding her. Her husband’s religion allowed him to have multiple wives, so Fatma shared her husband with another family. She was only fifteen when she bore her first child. Maybe it was the stoop in her shoulders, or her thin body or the hopeless look in her eyes that made the impression that Fatma was middle-aged. Shockingly, this woman, whose husband divorced her three years ago, is only 25 years old! Tossed aside and abandoned when she should be at the prime of her life. There is no one to provide for her and her children. Her children’s father is still living with his other wife and seven kids. There is no assistance for them. No government hand-outs. Only charity…from other very poor neighbors. One less daily worry for Fatma is her son Gamado. His school tuition and books are being provided by Lifesong Ethiopia, thanks to wonderful sponsors. His tummy is fed a nutritious breakfast and lunch at school each day. His education may help her future someday too. It is our hope that Gamado will share the “SON” that he hears about in school, at home with his family, so someday HOPE will shine in his mother’s heart. Will you consider helping Gamado and his classmates by helping build their new school for grades two thru fourth? Our current school in Adami Tulu only has room for Nursery, Lower K, Upper Kindergarten and First Grades. We need to start building now because Gamado and his first grade classmates will need it by Sept. 2013. Lifesong has been blessed with a partner that underwrites all US administrative and fund-raising costs. That means 100% of your donation will go directly to the need…helping orphans.